The gallery is just random pictures. If there’s anything you’d like an explanation for, just ask. I can’t do it justice. I wish I could write something meaningful about the Ares I-X launch, but all you’re going to get is just random observations. She was beautiful. Wow. After trips down and seeing the shuttle peeking over the pad, Ares I-X was majestic, amazing. She towered over the pad. And the pictures I’ve seen of her all along the development process didn’t begin to do justice to how she looked waiting for launch. Just beautiful. My first sight of her, stacked and ready, was when we arrived Monday afternoon, while it was still light, from “my” pier in Titusville across the river from KSC. And, yeah, she was amazing. After dinner, we went back to the pier in the dark. And — wow! With the xenon lights piercing the sky, she was incredible. And that was the first time I really began to understand how glad I was I went. Because there has not been a sight like that in decades, and likely won’t for decades. In pictures, the white-with-black I-X looks a little plain compared with the more colorful Ares I. On the pad, though, I can’t help but think that the white upperstage is going to have looked for more regal than the orange. 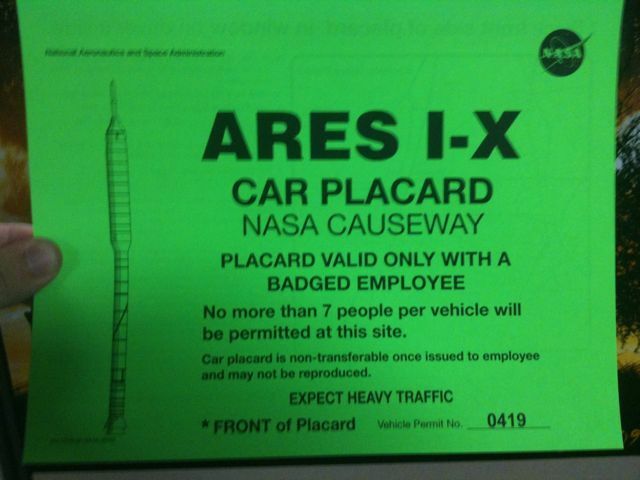 Add to that, Ares I won’t be rising alone out of the launch complex in quite the same way as I-X. I may have been there for what will be the most beautiful pad view for a half-century or more. The cool thing about the trip was, even the scrub was fortuitous. It meant she was still on the pad Tuesday afternoon for me to see her from closer up (though not nearly as close as I would have liked) on a KSC tour, and meant that the actual launch weather on Wednesday was much better than it would have been on Tuesday. That photo gallery up there has MUCH better pictures than it would have if there hadn’t been a scrub. And, really, how much can I complain that I had to spend an extra day in sunny Florida? So, the launch then. I was going for history. 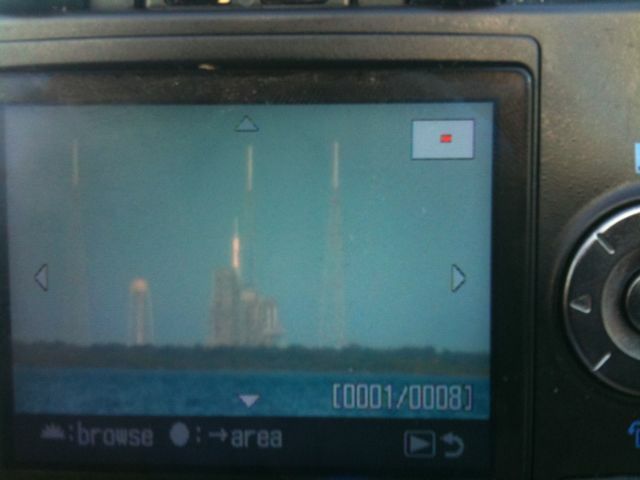 I was going to be about twice as far from the pad as I had been for the STS-125 launch in May, watching a vehicle with less than half the power. 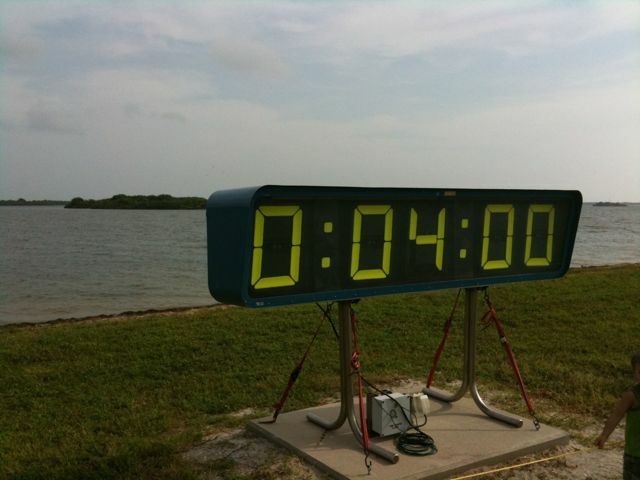 So, mathematically, it should be, what, a quarter as awesome as the shuttle launch? So I was there because I wanted to have been there when she flew. The reality, though — it was better than STS-125. Even farther away, even with less power. A lot of that was the weather, to be sure — we could see her for far longer than we were able to see Atlantis. And it was a beautiful launch. I was shocked at how slowly she rose from the pad. I’ll admit I haven’t looked at the numbers, but off the top of my head, I was expecting a thrust-to-weight ratio that would cause her to shoot off the pad much more quickly. Instead, she rose gloriously and luxuriantly. Again, amazing. And, something that BIG, that tall, flying like that — she looked … unlikely. A bold defiance of physics. Phenomenal. And it was history. The first of her kind. In a way, the only of her kind. Sui generis. And she flew brilliantly. All of the naysayers, all of the criticisms that she was too tall, too thin, too top-heavy, whatever, became obsolete. She flew. She flew. And it made me proud to wear my badge. To be a part, however small, of NASA. To be a part of Marshall Space Flight Center. It’s an honor. An incredible honor. There was a moment after the launch, on the way to lunch, when I realized just how much the way I think has been shaped by my time with the agency, by working on the book, by the company I’ve kept. There were a lot of adjectives that came to my mind over the preceding two days, a lot of which I’ve used here — beautiful, amazing, incredible, majestic, historic, phenomenal, etc. But there was one adjective that just really summed everything up for me. That gave me goosebumps just thinking it, that’ll give me goosebumps now writing it. And it turned out to be not completely true, but it was certainly close enough. The highest praise you could give Ares I-X and her flight. Actually, there was a bit more to it, but I’ll have to catch up later. Until I can download from my camera. OK, granted, the Star Wars Uncut trailer is pretty cool. But my favorite part is definitely Scene 236, which is, of course, best enjoyed with a-ha’s Take On Me playing in the background. That said, now I really want them to expand that scene out to a full Star Wars trailer set to the song. There seems to be a theme with some people I’ve talked with recently, so I’m posting this here, for people who may or may not read it and may or may not know they need it. ‘Cause that’s the way I roll. Stuff Dave feels like blogging about today. Like, even more random than a weekend update. –I saw Orionid meteors yesterday morning. Only three of them, I think, but this is still a big deal, inasmuch as it’s been a very long time since the last time I saw meteors. I have astronomically bad luck — when I remember to go and look for meteors or other such events, it’s invariably overcast; if it’s clear, I’m otherwise occupied (or forget). I do a bit better with space station sightings, but only because I try to see it enough that my low success ratio still allows a decent number of sightings. But, yeah, the Orionids was definitely worth dragging myself out of bed pre-dawn for just to have the experience. —Jennifer Knapp is back. This makes David happy. –I’m going to Florida next week to watch the Ares I-X launch. This also makes me happy. I’m traveling with someone I met back in July at the Space Camp Hall of Fame event; we’ve talked for probably an hour. This will be my third road trip to watch a launch, and I’ve traveled with completely different company each time. I-X will be a truly historical event, and it will be cool to have been there for it. Right now, Ares I-X is sitting on Pad 39-B at Kennedy Space Center, while, not too far away, Atlantis is sitting on Pad 39-A. This is the second time this year that both pads have been occupied; Endeavour was on B when I saw Atlantis launch from A back in May. 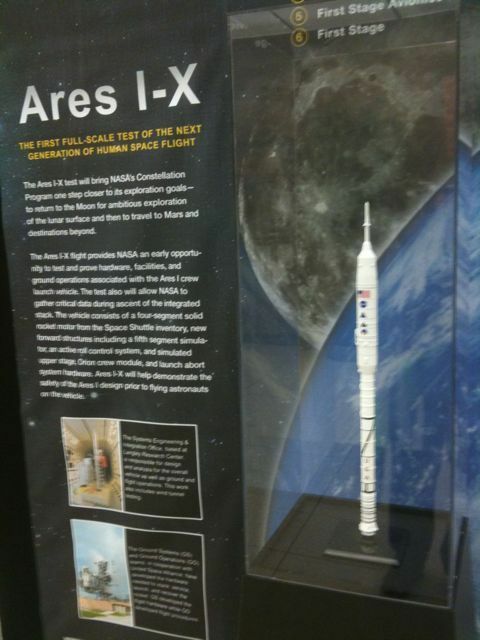 (I also saw part of I-X on that trip in the VAB.) My friend Robert Pearlman put together a pretty cool photo gallery on collectSPACE. And as a Huntsvillian, it’s very very cool that the the Redstone stripe really is about to fly again. –B.B. King is playing in Huntsville in January. I’ve seen him several times at the annual homecoming festival in Indianola, but that’s a rather unique show, and I’ve always wanted to see him do a real concert. I’ve ordered my tickets, and in just over a couple of months, I will. –I ate at two restaurants for the first time yesterday; Dolce at Bridge Street and Sam & Greg’s on the square downtown. Both were good; Dolce was one of very few places at Bridge Street I’d never eaten before, and I’ve been meaning to eat at Sam & Greg’s since it took the place of our old improv show venue downtown. I also got to introduce people to Maggie Moo’s ice cream shop at Bridge Street two days this week, which was fun. –Speaking of restaurants, I’ve written about eating at astronaut José Hernández’ restaurant while in Houston, and having him be my waiter while awaiting his first spaceflight. 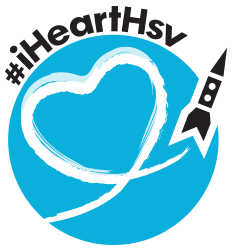 Well, Huntsville now has an astronaut-(co-)owned restaurant of its own! I’ll have to try it soon. –I mentioned yesterday that I had ordered And Another Thing… after reading the introduction and a few pages at the bookstore. I’m curious to see whether this is true of the book, but, in the introduction at least, the most bizarre thing, the thing that distracted me, was that the Guide has become … realistic. When I first read HHGTTG, the Guide was this fantastical device. Now, it’s fairly practical, and is described in terms from today’s technology. Sigh. –I’m hosting an improv show tomorrow night, and am playing in one Saturday night. Come check us out. –I’m also going to be doing some acting in a video project, but it’s secret, so I can’t tell you.